The correlation (or not) of divided government, market performance, election expectations and investor psychology has been a recurring theme on DWSUWF since the beginning of this blog (see 2006, 2007, 2008 , 2009). "I am reluctant to link longer term market behavior to any policy or partisan mix in Washington. I've not seen any studies that show a believable, statistically significant correlation between long term market direction and Republican, Democratic, or divided governments. That said - in the short term it is less important whether there really is a correlation so much as whether investors believe there is a correlation. My sense is that most investors believe the stock market will benefit from Republicans taking control of either the House or Senate in the fall. With that expectation, a rising market could very well be a self-fulfilling prophecy." Indeed it might. And like in the 2006 mid-terms - perhaps happy days will be here again (at least as far as the market is concerned). The full unedited clip from CNBC is linked here. Yes - Amanda Drury did, in fact, turn to the panel and ask "Double-D or not Double-D? What do you think?" I thought Insana was going to lose it. people who might be interested, that would be great too. Thanks. PS: Sorry for the off point response to your post, but I did not know know to otherwise communicate. Feel free to not post this or delete it. 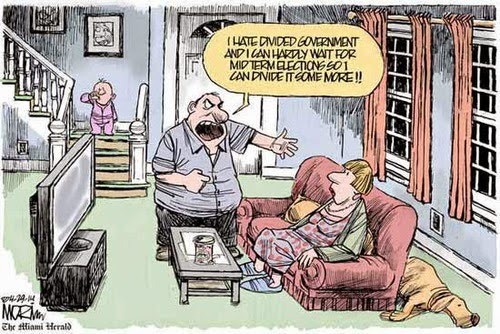 Someone who is for divided government is almost by definition a pragmatist. Yeah... I've been kind of dithering on how to respond to Daryl. He seems sincerely dissatisfied with his choices at the ballot box - wwho among is not? I guess it boils down to this - if you were looking for a 3rd party recommendation - you've come to the wrong place. OTOH, if you are just frustrated with voting R or D, and looking for a pragmatic voting heuristic that can actually have an impact, I've got something for you to consider. Federal government should be limited in scope, provide for common defense, protect and respect individual rights, spend and tax in a fiscally responsible manner, provide effective oversight of elected and appointed representatives, legislate carefully and slowly, and pass only laws that are tempered in the fire of partisan debate. ... then I have a recommendation for you - Voting consistently for divided government. That means voting a straight Republican ticket for federal offices in 2010, and should the Republicans take a majority in Congress, vote for the re-election of Barack Obama in 2012. Let's call it the Dividist Party. No leaders, no party infrastructure, no conventions, and no candidates. 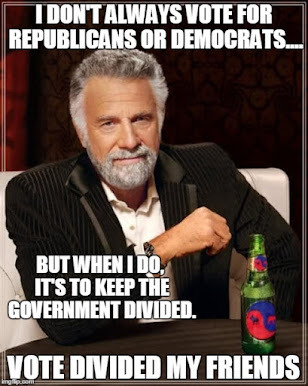 Just vote to keep the government divided. It is like a 3rd Party, except if it has a positive effect on the election - you get the policy objectives you voted for and not the opposite. My shorter version would be to ignore party histrionics altogether other than to note any extreme imbalances and to vote for the candidate that best represents your own views. Of course that means actually paying attention, something experience suggests to me is not a real strong suit of the general electorate. I'm a pragmatic pluralist myself. I can conceive of circumstances where undivided government could be a short-run good thing, I just haven't actually seen those circumstances. Our Founders knew what they were doing when they attempted to structure our system to make it difficult to get things done without overwhelming agreement, especially in giving the minority side of any issue/schism some extra obstructionary tools to fend off the "tyranny of the majority." As Heinlein once put it, "Vox populi vox Dei" most often translates best as "My God, how the hell did we get here?" I grok that. Smart guy that Heinlein. He also coined the acronym "TANSTAAFL" - later adopted and popularized by Milton Friedman. I don't see the divided government voting heuristic to be an end in and of itself. I just don't see any other practical way of getting from the "how the hell did we get here" to where we need to be without taking that first step to restrain the worst instincts of both parties. It is simply a pragmatic means to that end.